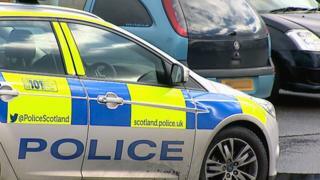 A man has been attacked and robbed in his own home in Lockerbie. The 28-year-old was assaulted by two men who stole cash and jewellery worth more than £4,000. The incident happened at a property in Sydney Gardens between 13:30 and 14:30 on Saturday. The man was treated for minor injuries and police believe two men were involved, thought to be in their 20s and speaking with west of Scotland accents. One had blonde hair and was wearing a hi-vis yellow jacket, dark boiler suit and a hard hat and was carrying a tool bag. The other was of slim build with black hair and wore a navy blue Adidas tracksuit. Police are asking anyone who saw what happened to get in touch. Det Insp Dean Little said: "This type of crime is very rare indeed for our area and a team of detectives are now working on the case with a view to catching those responsible. "We are asking anyone who lives in Sydney Gardens, or the surrounding area to get in touch with us if they saw either of the two men described. "Likewise we would be keen to hear about any vehicles which might have been seen entering or leaving, or even parked up in the area on Saturday. "We are also reviewing CCTV footage from cameras in the area, and any dashcam footage which anyone has while driving in the area would be welcomed."